With the good news of the return of 2D, Northern Ireland's Comics Festival, for its fifth year in the Verbal Arts Centre in Londonderry at the beginning of June, perhaps it is an appropriate time to take a look at what else is happening comics-wise in the Province. In Derry, 2D has inspired and supported local small pressers who have combined into the 2D Collective. As well as a blog the Collective has published, with the help of the Verbal Arts Centre, two collections of comics, Fear and If Stones Could Speak. There are more details about the 2D Collective on their blog. Meanwhile Belfast has already played host this year to the Guardian's political cartoonist Steve Bell who gave a talk at the Out To Lunch Arts Festival in January. Also in Belfast the Crescent Arts Centre is currently running two ten week long courses, an illustration class with David Haughey entitled Visual Narrative which runs on Wednesday evenings and a Cartoon Masterclass with John Farrelly which runs each Saturday. There are more details of the Crescent Arts Centre courses on their website. For Ulster otaku the Forbidden Planet International store in Belfast (despite still being called "Talisman" by some locals) has joined in with the rest of the UK stores in arranging manga evenings, including quizzes, cosplay and money off offers with the last one being just this week. There are more details of their events at the FPI Belfast Facebook page. Also in Belfast there is a regular meeting of local comics people, both small press and professionals, in the Cloth Ear bar at the Merchant Hotel in Waring Street. They also run a well designed and informative blog under the simple name of Belfast Comics using the Belfast Big Fish as their logo. If that wasn't enough they also sell both their own small press comics and those of other creators from both north and south of the Irish border at the monthly Black Market indoor indie/alternative fair at the Black Box arts venue in Belfast. The next Black Market will be held on Sunday 6 March. There are more details of the Belfast Comics group on their blog and details of their meetings are listed on their Facebook page. The downthetubes Comics Events calendar is available for Northern Ireland organisers (as well as those in the rest of the UK) to advertise their events for free, and while tagged as British Comics Events, we are more than happy for organisers in the Republic Of Ireland to use it to promote their events as well. The Cardiff International Comic Expo takes place at the end of this month - and with it, the launch of 10thology, an exciting looking comics project featuring a host of top Welsh comic creators, including Mike Collins, Si Wyatt and Dylan Teague. 10thology features 10 stories, each 10 pages in length, written and illustrated by some of Wales' brightest and best creative talents. From comic industry legends such as Mike Collins, to Indie/Small Press creative studio Monkeys with Machineguns, and newcomers to the world of comics from the fields of film and animation, these creators have come to together to create a unique set of stories all linked with a distinctly Welsh theme and flavour. Welsh artist Stu.Art (Stuart Tipples) is the man behind the project and explains the idea behind the book. "I would go to regular social meetings with the writers and artists that feature in the book to get together, catch up, and see what everyone was working on or meet up at the various comic conventions (usually taking place on the other side of the bridge). 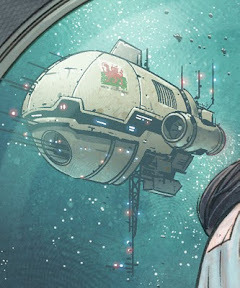 "It occurred to me that there was such a wealth of Welsh talent from creators living and working in Wales at these events that we could create a very original and unique book." 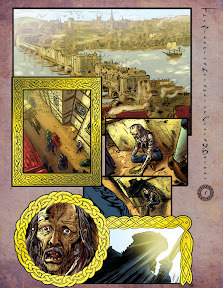 • 10thology will be released at the Cardiff International Comic Expo on Saturday 26th February 2011. Tickets are available for pre-booking online at http://www.fantasyevents.org/cice - but they've almost sold out, so hurry along now! • All advanced ticket holders to CICE will receive a promotional 10thology postcard that gives them £2.99 off the RRP of £14.99 and entry into a competition to win original 10thology art. 10thology goes on general release summer 2011. Signature Publishing, whose titles include Dinosaur King and Dinomite, are to release It's... Jokes magazine later this month. The new magazine is the fourth in their successful “It’s…” series, aimed at 5 to 10 year olds and, say the publishers, will feature "tonnes of side-splitting gags, crazy puzzles and sneaky pranks. 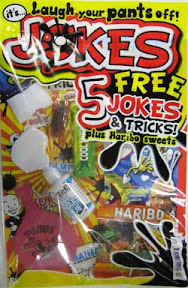 "Every issue comes with a mega-mischievous joke pack, containing five free tricks; a whoopee cushion, fake spilled glue, pretend nail through the finger, a creepy cockroach, snappy chewing gum plus a free packet of Haribo sweets." There's no indication from their press information on whether the title will include strip material, but you'd at least expect some cartoons with a name like that. Signature Publishing’s portfolio includes Dinomite, Turbo Xtreme, Easy Peazy, Fantastic Funworld. Labels: New British Comics, Signature Publishing Litd. Skyjack Publishing, the company behind their own title, Megaton and who have also packaged comics such as Ben 10 for Egmont, launch a new UK monthly magazine, Moshi Monsters, later this month. 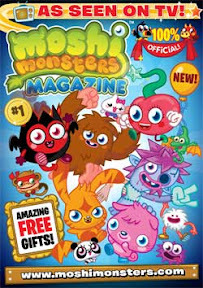 Based on the hugely popular online game that lets you adopt your own monsters, the 52-page magazine is aimed at boys and girls aged six to 12-years old, and will feature have puzzles, activities, recipes, comic strips - including work from comic creators such as former TOXIC artist Jon Rushby - and competitions about the Moshi Monsters world. Issue 1 includes two free in-game items for kids to decorate their monster's rooms, as well as two packets of Moshi Bandz and a pack of Topps Mash Up! trading cards. Described as Tamagotchi meets Brain Training online for kids, Moshi Monsters is the phenomenally successful web game for children that allows them to create virtual pets, which they then maintain by way of educational based gameplay. Launched in January 2009, Moshi Monsters now has over 30 million players worldwide and is not only one of the largest children’s websites in the world, but is also one of the fastest growing children’s entertainment properties ever - and it's estimated that one in three British children in the target age group have created a Moshi Monster online. As an added bonus for Moshi fans, the magazine will feature secret codes to hidden levels and exclusive redeemable in-game items. • Moshi Monsters goes on sale on 17th February, with a cover price of £2.99. STRIP Magazine publisher Ivo Milicevic read our recent feature on Classic British Comics Collected and kindly sent us some scans of some classic strips that were syndicated into former Yugoslavia, where comic fans were also once enthralled by Dan Dare, Trigan Empire, the Steel Claw and more. It was strips like this that shaped his love of British comics, culminating in his plans for a UK imprint. Most of the scans featured here are taken from a comic called Panorama, which launched in 1965 and ran until 1971, with total of 318 issues. "It was old Yugoslavian title, but publisher Forum was from Novi Sad-Serbia," Ivo tells us. "It was weekly when it started and had 24 pages, half of them in colour. Later, it expanded to 32 pages. "It was cleverly edited, with a mix of both British and a few popular French and Belgian comic strips. "The UK strips included Trigan Empire, Steel Claw, Jet Ace Logan, Black Archer, King Kong [actually the British strip Mytek the Mighty], Dan Dare, Saber King of Jungle, Johnny Coguar, Karl the Viking, Olac the Gladiator, Jailbird Commandos (there were too many World War 2 stories to mention! ), Zip Nolan and more. 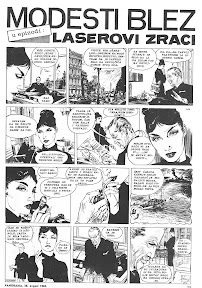 "It also featured newspaper strips such as Wes Slade, Modesty Blaise (as 'Modesti Blez'), and James Bond." "Panorma was my favourite comic that I use to read as kid (along with Plavi Vjesnik, which I now own)," Ivo enthuses, "and I have full collection now." As Richard Sheaf noted in a feature in Titan Books recent Dan Dare collection Safari in Space, Dan Dare had a longer run in Plavi Vjesnik, a comic from publisher Vjesnik (based in Zagreb, in modern day Croatia) that ran from 1954 to 1973 and has been revived sporadically since the early 1990’s, most recently by Ivo (see our 2010 news story). 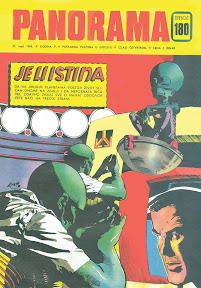 Plavi Vjesnik was the first Yugoslavian comic to contain Dan Dare reprints (or Den Deri as he was known), although he did appear in other titles as well as Panorama, such as EKS Almanah and ZOV. "Strangely, they re-coloured Dan Dare for the comic, then ran it later in black and white," he notes. "Plavi Vjesnik was the first Yugoslavian comic to bring us Dan Dare in his original glorious colour." In addition to reprints in Panorama and Plavi Vjesnik, characters such as The Spider and the Steel Claw were also re-published in separate pocket library editions, just as they were in the UK. It's always fascinating to learn more about just how widely syndicated British comics once were - and how enduring their popularity is beyond our shores. This is one of those 'lucky finds' on the Web, courtesy of Blogger's 'Next Blog' button. In the past, these often used to throw up random spam sites, but it seems Google has been cataloguing their blogs, so clicking 'Next Blog' on downthetubes might just take you to another comics-related blog. Although still something of a lucky dip, last night I came across the official blog of artist John Watkiss. Best known to comic fans for his work on titles such as Sandman, Conan and Deadman, Brighton-based John's extensive career has led him from cover artist for graphic novels to storyboard artist and character designer, working for companies such as Saatchi & Saatchi, Ridley Scott Associates, DreamWorks and more. 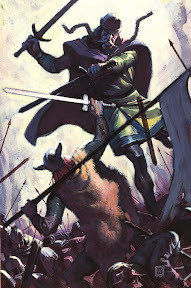 His Conan work remains some of his best known work, so it's perhaps no surprise that he has provided the illustrations for a new Robert E. Howard collection, Sword Woman and Other Historical Adventures. The adventures are set in medieval-era Europe and the Near East, described by publisher Del Rey are among the most gripping Howard ever wrote - full of pageantry, romance, and battle scenes "worthy of Tolstoy himself". Most of all, they feature some of Howard’s most unusual and memorable characters, including Cormac FitzGeoffrey, a half-Irish, half-Norman man of war who follows Richard the Lion-hearted to twelfth-century Palestine - or, as it was known to the Crusaders, Outremer; Diego de Guzman, a Spaniard who visits Cairo in the guise of a Muslim on a mission of revenge; and the legendary sword woman Dark Agnès, who, faced with an arranged marriage to a brutal husband in sixteenth-century France, cuts the ceremony short with a dagger thrust and flees to forge a new identity on the battlefield. At almost 600 pages, the book features plenty of illustration by John and also includes miscellanea, informative essays, and a fascinating introduction by acclaimed historical author Scott Oden. Worth taking a look. 2D, held at the Verbal Arts Centre in Londonderry, is the UK's most westerly comics convention and for the last four years it has been the largest comics event in Northern Ireland if not the whole island of Ireland. This year's event will take place between Thursday 2 and Saturday 4 June 2011. While Derry's recent troubled history overshadow's much of its past, from the 3 month long siege in 1689 to the surrender of the Nazi U-Boats in 1945, as the UK's first City Of Culture in 2013 the city's future looks bright. In a city so full of history it is unsurprising that the 20th century Verbal Arts Centre is in the former 19th century First Derry School located on the 17th century walls of the city. 2D organiser David Campbell works as the artist in residence at the Verbal Arts Centre and, in a move that must leave other UK convention organisers green with envy, is able to get 100% arts funding for 2-D meaning that all the various events and workshops that make up 2-D are completely free. This even extends to the sales tables allowing not just dealers but also local, and not so local, small pressers to get their work seen by the public. Indeed a small press group, the 2D Collective, has grown up around the convention. We tend to use the term 'convention' to describe many types of comics gatherings from small press get-togethers like Caption to large professionally organised events with major international names such as Kapow - two events that couldn't be more different. The mainland convention that 2D is most similar to is Thoughtbubble in Leeds and, like Thoughtbubble, 2D describes itself as a 'festival' with different events taking place at different times over several locations but with a main weekend daytime event bringing together signings, sketches, cosplay and sales tables which takes place in the Verbal Arts Centre. Evening discussion sessions are held in the less formal surroundings of Sandinos Café Bar at the opposite corner of the city walls towards the banks of the River Foyle. Previous 2D guests have included major names such as Pat Mills, David Lloyd and Bryan Talbot while many local artists including familiar names such as Will Simpson and PJ Holden also take part. Guests already scheduled for 2011 include DC Art Director Mark Chiarello, writer Denise Mina and artists John Higgins, Dave Taylor, Gary Northfield, Jim Medway, Garry Leach and Rufus Dayglo. Northern Ireland's physical separation from the rest of the UK has been something of a barrier to 2D being accepted by comics fans as part of the regular convention circuit as it is not a simple car or train journey from the majority of UK addresses. Yet considering that some fans from the opposite ends of the country take flights to get to conventions in Bristol, London or Inverness, the flights (or ferry) to get to Northern Ireland really shouldn't be seen as a step too far. There are more details of 2011's 2D convention on its Facebook page and website which includes travel advice on how to get to Derry/Londonderry and accommodation suggestions once there. 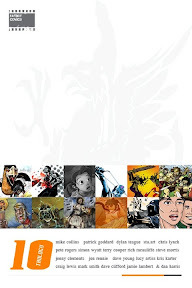 There are more details of previous 2D conventions at the Irish Comics Wiki. "The strips were printed in orange, red, purple, blue and even green and considering the throw-away attitude the quality was not perfect," Terry notes. "In some cases it has taken a month of work to remove sellotape repairs, foxing and just plain decayed pages. "Quality ranges from high to medium - but then, if you are interested in this period or a comic historian these collections are about the only place you’ll find the strips and cover prices are low (ignoring all the work put into the books). Three pages of Adam Eterno art by Solano Lopez are currently on sale on eBay. All three pieces are from the Peter Hansen IPC Archive Collection, who bought IPC's entire archive of art some years back, and are all from Lion and Thunder No 1039, cover dated 3rd June 1973, in which Adam Eterno arrives on a Carribean island to battle injustice during the Festival of Xahu. 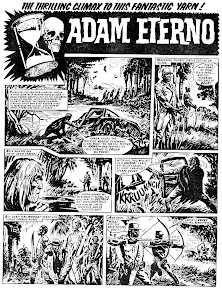 Immortal time-travelling Adam Eterno first appeared in Thunder comic in 1970, but proved such a popular character he survived several title mergers as Thunder merged with Lion after just 22 issues in 1971, then Valiant with Lion in 1974 (becoming Lion and Valiant). 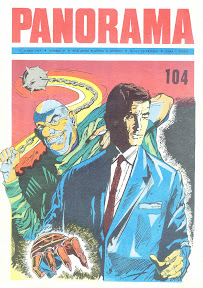 His last official appearance to date - albeit a reprint - was in the 1980 Valiant annual. Time for some gratuitous self promotion for The Quest, a comics project I'm working on with ace artist Smuzz (whose credits include 2000AD and Interzone). 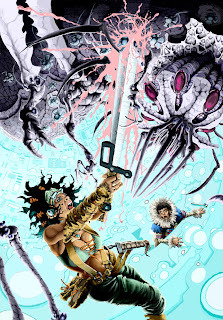 Here's a terrific promotional image for The Quest, which will feature in STRIP Magazine later this year. The story springs from a project Smuzz and I started over 20 years ago, but for various reasons it fell by the way side until now. It might look like sword and sorcery... but trust us, there's a twist. There's a little more information on the strip's blog here. There's still a lot of work to be done - 12 pages are drawn so far, which feature, so far, two fights, more weird creatures than I know what to do with - all of them wonderful - and one of the major baddies has taken its first victim. It's all tremendous fun and I hope you'll enjoy the final results when it's published. For many people the highlight of the comics year in Scotland over the past three years has been the Highlands International Comics Expo, Hi-Ex, organised by Richmond Clements and Vicky Stonebridge and held in Inverness in the first few months of each year. For the last two years downthetubes contributor Jeremy Briggs has provided the Hi-Ex convention brochure with a review of the previous year's comics events in Scotland, with the Hi-Ex 2 brochure covering those events in 2008 and the Hi-Ex 3 brochure covering those events in 2009. These articles came about after discussions at the first Hi-Ex showed that many people were unaware of the extent of comics events north of the border and that there was a general consensus amongst attendees that such events only happened in the Midlands and the south of England. The aim of these articles therefore was to document all comics related events in Scotland that were open to the general public, from talks to exhibitions, workshops to conventions. 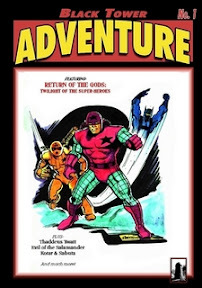 Despite the decision to postpone Hi-Ex 4 from 2011 to 2012, Jeremy chose to continue with his annual Scottish review for 2010 and so, with the blessing of Rich and Vicky, downthetubes presents his 2010 review of comics events in Scotland on the downthetubes main site, as well as reprinting the 2008 and 2009 reviews from the Hi-Ex convention brochures. • More details of Hi-Ex, as well as photos from the past three conventions, can be found on the Hi-Ex website and the new Hi-Ex blog.